This is one of the newest additions to my garden, a Russian Sage. 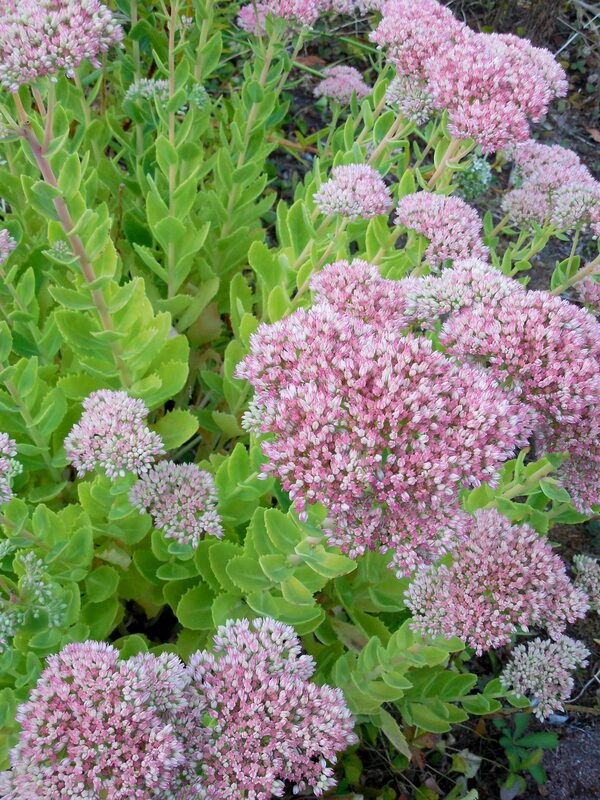 I have seen examples of these plants living in high-desert areas, and admired their growth and beauty in very low-moisture climates. For as wet a reputation that Southern Oregon has, the summers tend to be quite dry. Plants survive in my gardens on irrigation alone, so I always notice those that appear to thrive in what would normally be considered less-than-optimal conditions. It was planted in the middle of summer, a death knell to many plants is to be moved in the hottest time of the year. But this specimen showed its strength and grew just fine. 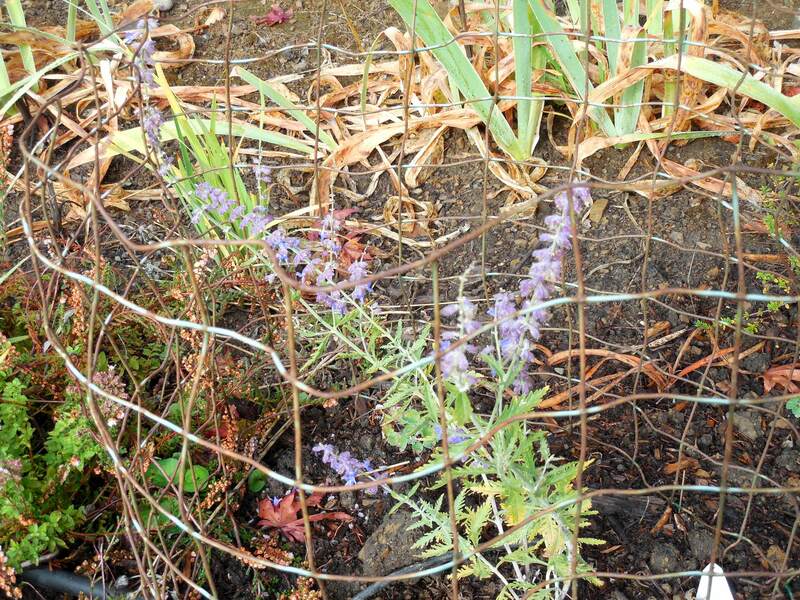 The piece of fence around protected the Sage from rabbits and deer as it gets established. I think it is in a good, permanent location, and could grow to be even three feet in all directions. The flowers appear to stay on the plant for quite awhile, another feature I like in a plant. I will need to remember to prune this shrub severely in the spring, I believe that will keep it from looking straggled. Categories: Uncategorized | Tags: desert, low-moisture, plant, prune, Russian, sage, severely | Permalink. 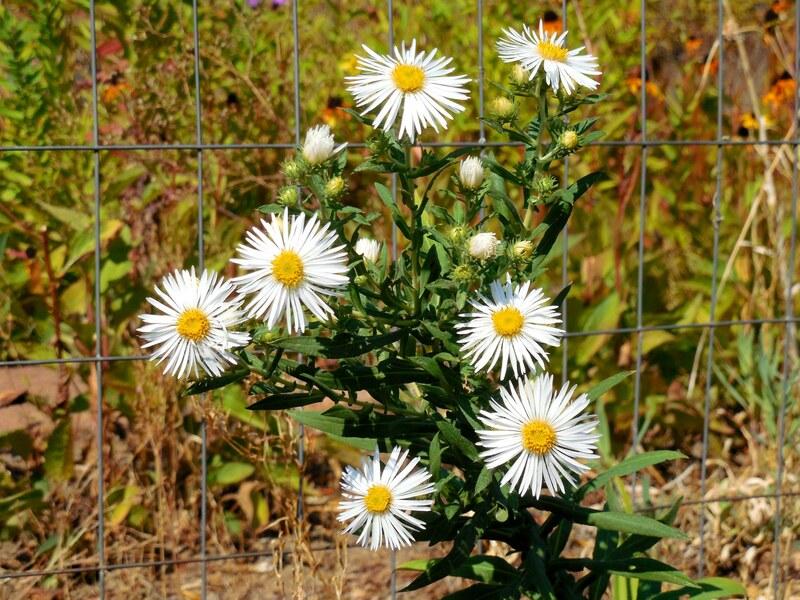 Asters make a liar out of me! These are the same asters I cut a few days ago. The flowers really did close up the next morning when I went to take a photo. For some unknown reason I did not throw throw them in the compost bucket. When I noticed the vase later, the blossoms looked great, and the tiny buds were starting to open. They must like their new home! Categories: Uncategorized | Tags: asters, blossoms, bucket, buds, close, compost, flower, vase | Permalink. Actually, autumn began at 7:30 pm last night, but today is the first day of the new season. 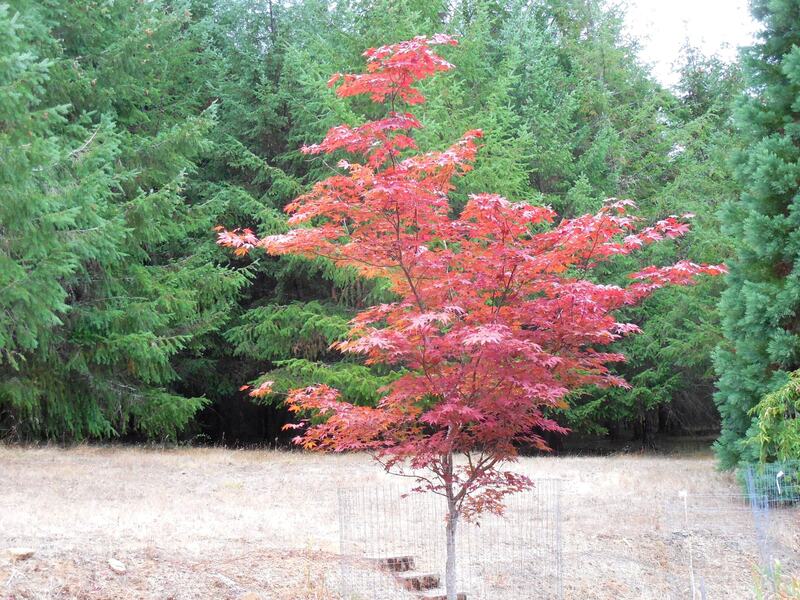 The color change of the leaves is very subtle, as it is just beginning, in this tree. If you look on the upper left side, you can notice the leaves getting lighter, as they lose the deep red color they had all summer long. Yes, that is a four foot high (122 cm) deer fence around the tree trunk. Although the tree appears to be tall enough that the deer cannot decimate its foliage, I will not even attempt to remove the fence until spring. There is barely enough forage for the deer at this time of year, and I have seen hungry animals stand on their hind feet to eat whatever they can. Categories: Uncategorized | Tags: animals, autumn, change, color, deer, fence, foliage, forage, hungry, Japanese, leaves, maple, red, spring, summer, tree, trunk | Permalink. I know I already did a post about aster flowers, but the white ones just bloomed. Have you ever noticed that the white flower of a plant blooms at a different time than the other colored flowers? I’m thinking of irises. The bearded ones or the Japanese Iris. White flowers bloom either before or after the other colors. In the case of asters, the white flowers are later. I really cannot remember what order the various colors of irises bloom. This will give me something (another thing) to observe next year. I am sure there are other flowers where the white specimen flowers at a different time, and I will have to pay more attention to find another example. There is even a nursery devoted to white flowers. But I believe they started like that, but have come around to selling many colors of flowers. 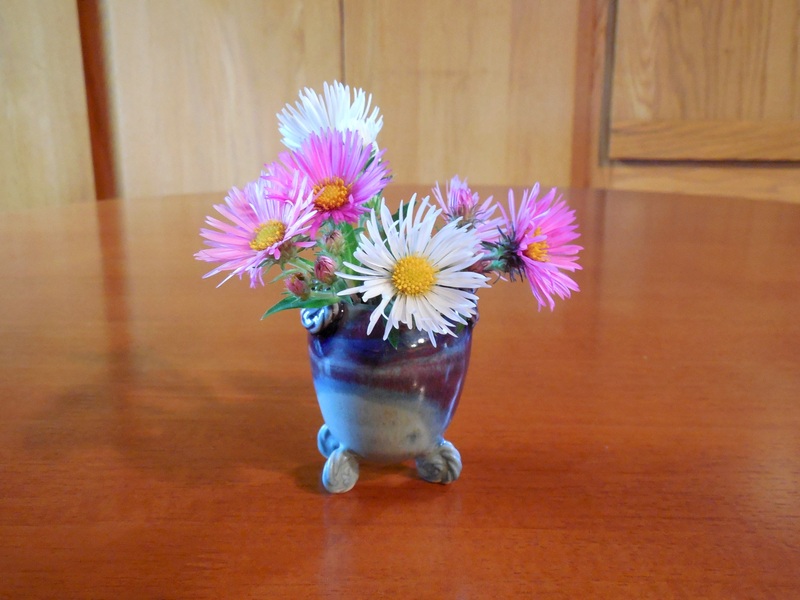 Last night, I cut stems of three colors of asters, and put them in a mini-vase to photograph in the morning. Well, that did not happen, as I learned (the hard way) that aster flowers are not for cutting. This morning they had closed up as though to say their time on this earth was done. Well, at least the blooming plants look good massed in the garden beds. Categories: Uncategorized | Tags: aster, bearded, bloom, colors, flower, iris, Japanese, white | Permalink. This is such a cool looking plant! When I bought it at the nursery, I was looking for deer-resistant plants, and this seemed to have all the attributes. 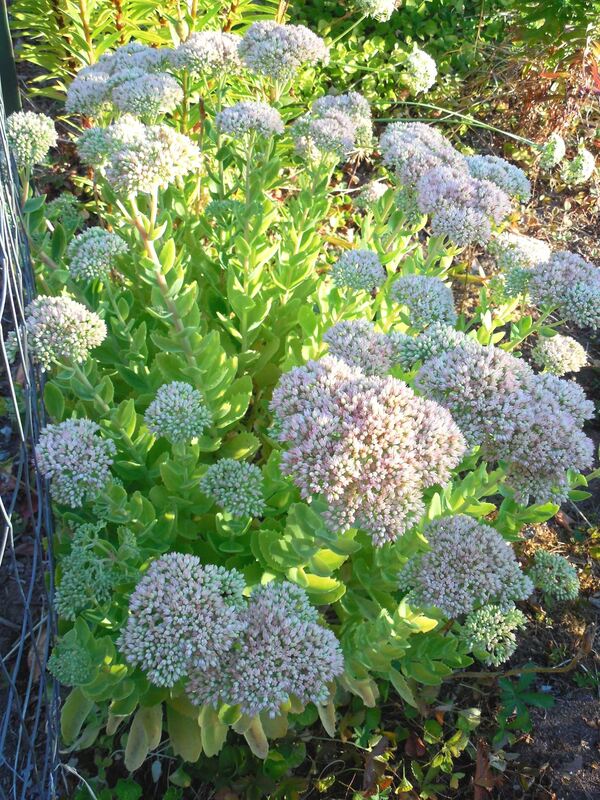 It has silvery, fuzzy leaves and a scent that is supposed to discourage predators. Well, the deer do keep this pruned, but it has more than survived. 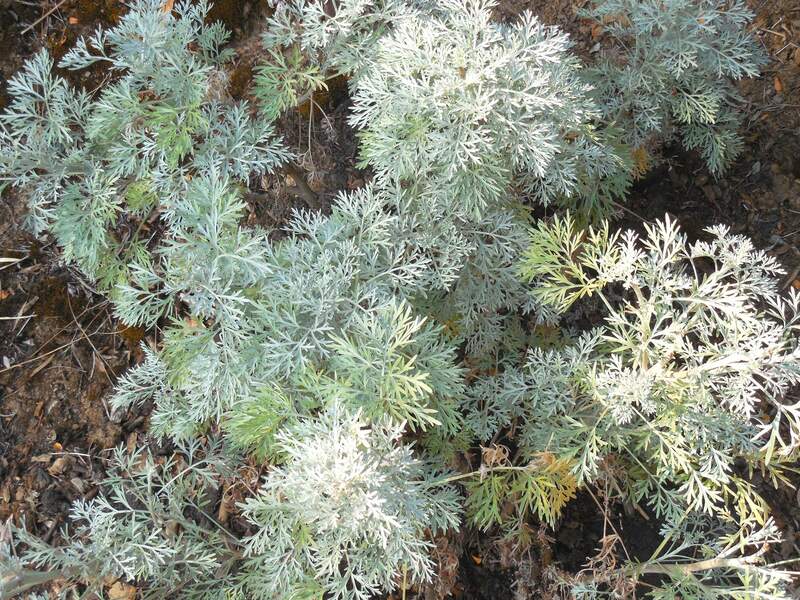 Artemisia anchors a minor deer path just outside one of my fenced garden areas. Does it sound funny to say a ‘minor’ deer path? From experience, I’ve learned that deer, like many other herd-type animals, tend to walk along the same paths. They have ‘major’ byways where the ground is stamped down strongly. Then there are the ‘minor’, side roads which get used less often, but are pronounced. Deer are browsers, or grazers, which means they nibble as they walk. I believe this is a defense mechanism that makes them less vulnerable to attacks from predators. Unless, of course, they find a banquet they cannot pass up. But, I’m getting very sidetracked by talking about the deer and not the plant. Where I live, they are very intertwined. Categories: Uncategorized | Tags: animal, artemisia, browser, byway, deer, defense, fuzzy, grazer, herd, leaves, mechanism, minor, nibble, Nursery, path, predator, resistant, scent, silvery, vulnerable, wormwood | Permalink. 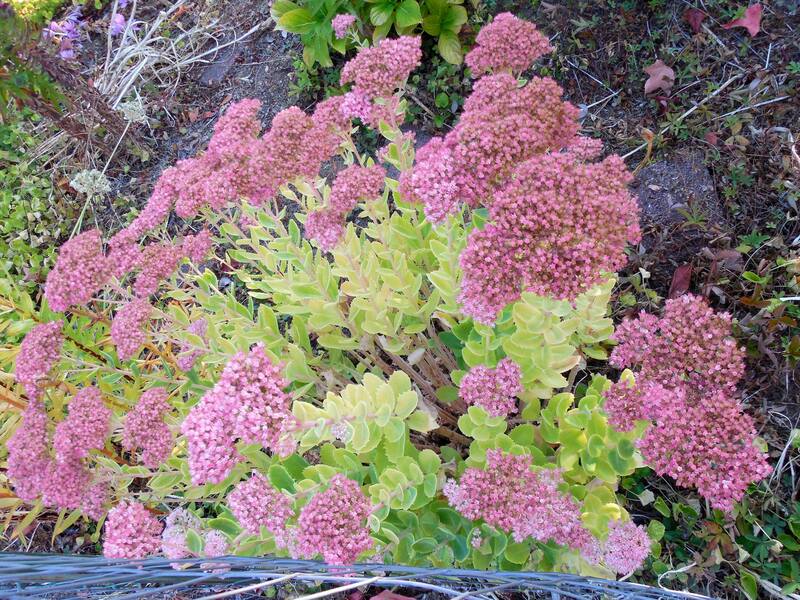 These snapshots show the progressive change of color of this outstanding landscape plant. (I see the photos are posted in reverse order.) 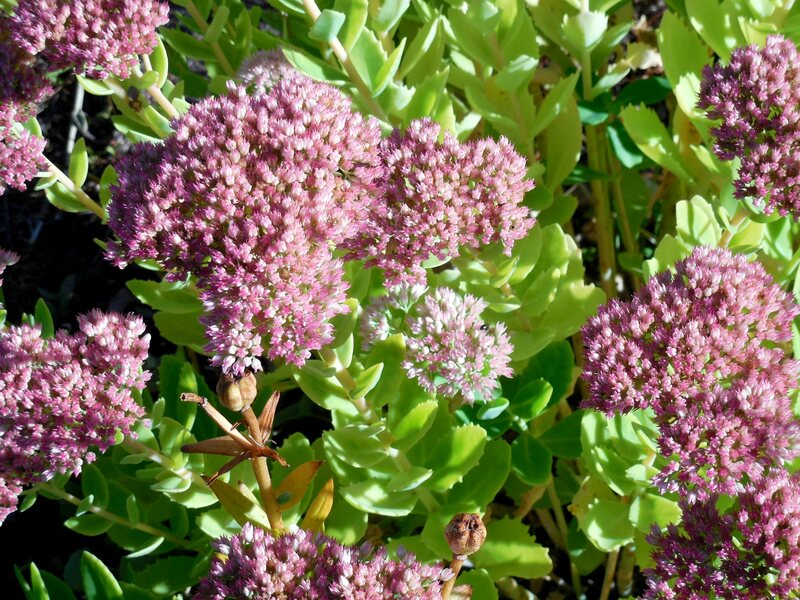 While many sedums are groundcovers, Autumn Joy easily grows to 18 inches tall. 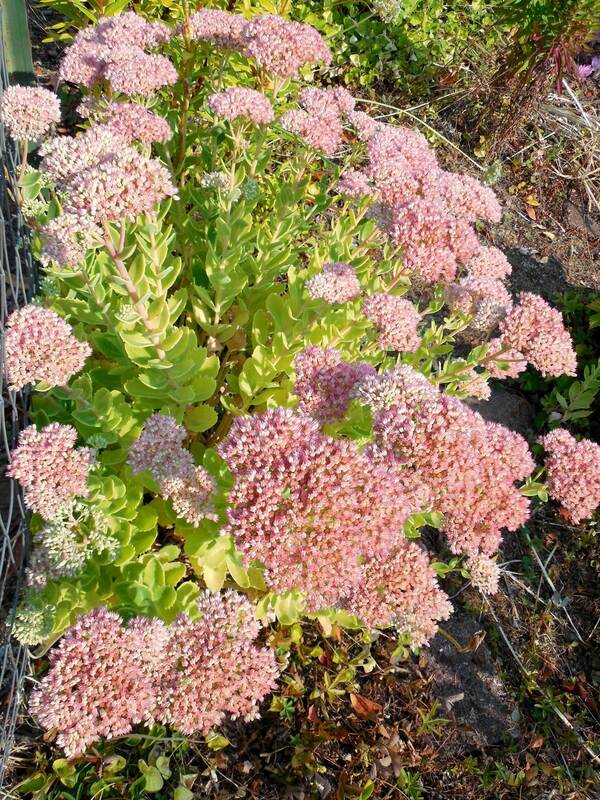 The above pictures cover the gradual darkening of this plant’s flowers. They were taken over the course of a month, and the flowers will keep on getting darker for another few weeks. I recently saw a line of about 20 barrels of these flowers decorating the entry to Maryhill Winery in Washington State on the Columbia Gorge. They were still in the early stage of color development, and would look handsome for another month or so. 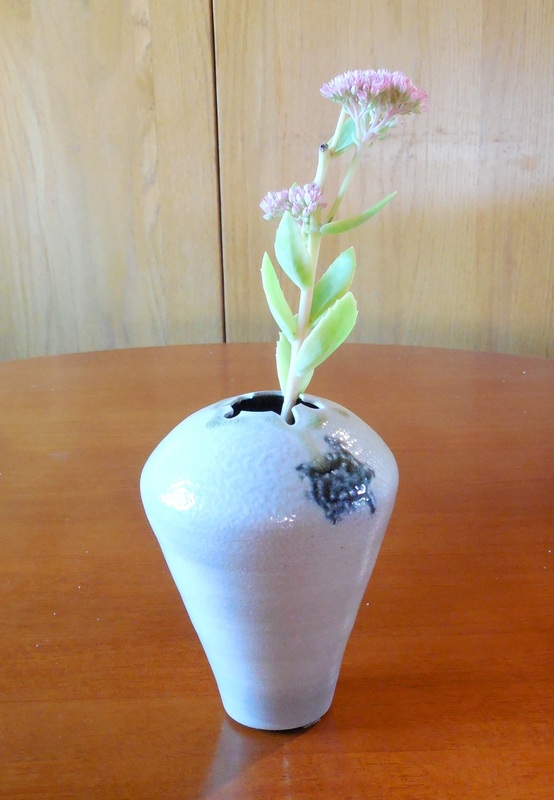 The bud in the Turtle Vase is still in the early stages of color change, as the stem was nipped by deer, earlier in its development. (If you look close, you can see the darkening of the stem cut near the top flower.) My plant is next to a fence, and the natives keep it pruned. This porcelain vase is made by me in my ‘other life’. A turtle is carved into the opening, and the piece was fired in my wood and gas fueled kiln. The orange-peel texture seen on the vase shoulders is from soda introduced into the kiln near the end of the firing. Categories: Uncategorized | Tags: autumn, change, color, Columbia, deer, firing, flower, gas, Gorge, joy, landscape, Maryhill, natives, plant, porcelain, pruned, sedum, soda, state, stem, turtle, vase, Washington, Winery, wood | Permalink. This is another gem my husband brought home one day. He wanted to fill an empty corner. It is not early to get it’s leaves, and they are ready to drop off any day now, and it is only mid-September. You are looking at the annual exhibit of the high point of its life. Although the leaves appear very autumn red and colorful right now, they are a boring green the rest of the year. 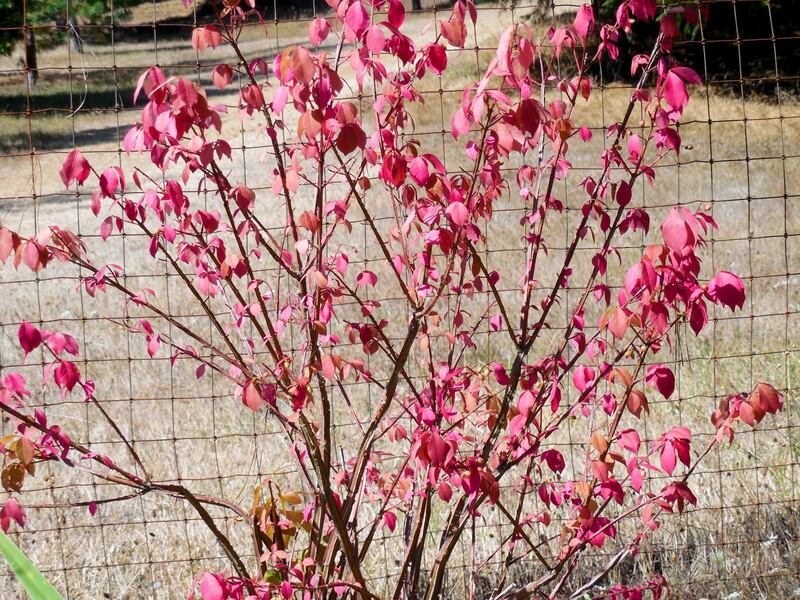 Categories: Uncategorized | Tags: autumn, boring, colorful, euonymous, irrigation, leaves, real estate, red, rose vine, scented, sun | Permalink.